Arguably one of the biggest threats of confidential conversations leaving a room or area of a facility is the ordinary loudspeaker or well-shielded microphone. When conducting a proper TSCM investigation, it is important to inspect all building wiring to ensure that no conductors are being used to transport stolen audio or video information. It is fairly simple for someone to attach a microphone to any two existing conductors present in an area and pass audio through a speaker “down the line” to be received elsewhere. The wiring used can be AC power lines, telephone wiring, speaker wiring, HVAC wiring, access control, intercom, etc. Generally, any two copper conductors will provide the path that the eavesdropper needs. Also consider that the hard work has already been done for your adversary; the wires already exist and microphones are already in place (intercom, video projectors, fire alarm, telephones). The only thing our bad guy has to do at this point is to exploit the existing vulnerabilities that have already been installed. Keep in mind that in the above examples a spectrum analyzer or broadband detector will not detect the attack because there are no free-space RF emanations. Additionally, a non-linear junction detector will have a difficult time locating a well-shielded microphone. 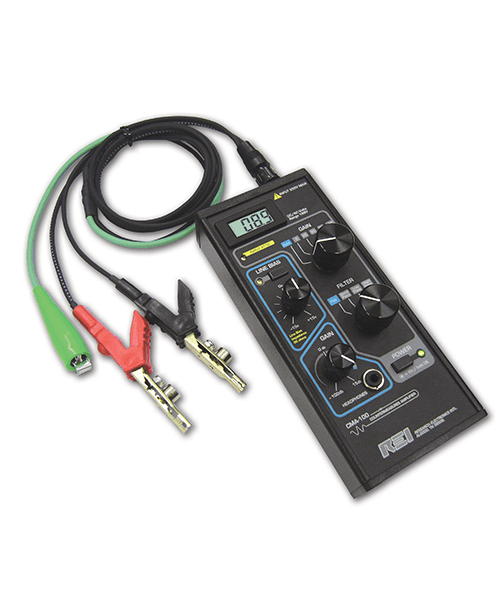 The CMA-100 Countermeasures Amplifier is the ideal tool to analyze miscellaneous wiring for analog audio and video content. In addition to detecting stolen audio, the CMA will allow the user to hear and identify the synchronization pulses of any video content present on the wires. The CMA is a multi-functional, high gain audio amplifier that has a built in AC/DC digital voltmeter, selectable audio filters, and an extremely wide dynamic range. The CMA has a balanced and unbalanced high impedance input that provides connectivity to a variety of suspect wiring. It is a common practice to utilize electret-type microphones for audio surveillance which require a voltage supply in order to function. Therefore, when evaluating suspect wiring, if the wiring does not have any voltage on the line, it is recommended to apply a DC bias voltage to activate any potential microphones. The CMA-100 also provides the ability to apply bias voltage, which is adjustable between +/- 14.5V DC. This feature can be used to activate these types of voltage-dependent devices. The CMA-100 can be a powerful testing tool in the hands of a trained TSCM technician. Its small size, combined with the audio grabbing capabilities which have made it known the world over, make it a valuable piece of equipment for your TSCM toolkit. The CMA-100 comes equipped with a unique set of test leads which are well suited for testing phone connection blocks, AC power wiring, or insulated and non-insulated wiring. Additionally, the unit’s optional acoustic leakage probe allows the user to test various surfaces (window glass, HVAC ducts, electrical conduits, overhead steel beams, etc.) for the presence of structure-born audio – or audio that is traveling naturally from one room to the next through acoustically susceptible surfaces. For more information on the CMA-100 Countermeasures Amplifier, click here.